"Architecture is not an inspirational business, it's a rational procedure to do sensible and hopefully beautiful things; that's all. " Harry Seidler (June 25th, 1923 - March 9th, 2006) was an Austrian-born Australian architect who is considered to be one of the leading exponents of Modernism's methodology in Australia and the first architect to fully express the principles of the Bauhaus in Australia. Harry Seidler came to Australia via England and Canada where he studied architecture. Although he was only ten years old when the Bauhaus was closed, Seidler's analysts invariably associate him with the Bauhaus because he later studied under emigre Bauhaus teachers in the USA. He attended Harvard Graduate School of Design under Walter Gropius and Marcel Breuer on a scholarship in 1945-46 during which time he did vacation work with Alvar Aalto in Boston drawing up plans for the Baker dormitory at MIT. He then attended Black Mountain College under the painter Josef Albers, and also worked for Marcel Breuer in New York. 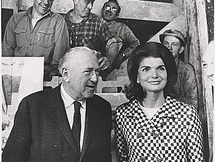 Harry Seidler married Penelope Evatt, daughter of Clive Evatt on 15 December 1958, they had two children, a son Timothy and daughter, Polly.Seidler enjoyed photographing architecture around the world and some of these are documented in his photography book The Grand Tour. Penelope Seidler, herself an architect, gained her Bachelor of Architecture from the University of Sydney and joined Seidler and Associates in 1964 as architect and financial manager. On 24 April 2005, Harry Seidler suffered a stroke from which he never fully recovered, and died in Sydney on 9 March 2006 at age 82. Harry Seidler designed more than 180 buildings and received much recognition for his contribution to architecture of Australia. Many of Seidler's designs were a highly demonstrative enactment of his Modernist design methodology, which he saw as an amalgam of three elements: social use, technology and aesthetics. He always insisted that he had no fixed 'style', since these three elements were in constant flux, and so his work constantly evolved throughout his 57 years of designing in Australia. He appeared impervious to recent trends in architecture, such as the stylistically broader and post-modern styles expressed by younger contemporaries such as Glenn Murcutt. Many of Seidler's designs were a highly demonstrative enactment of his Modernist design methodology, which he saw as an amalgam of three elements: social use, technology and aesthetics. He always insisted that he had no fixed 'style', since these three elements were in constant flux, and so his work constantly evolved throughout his 57 years of designing in Australia. The form of Seidler's work changed as building technology changed: from his timber houses in the 1950s, to reinforced concrete houses and buildings in the 1960-1780s, and the development of curves with advances in concrete techhnology in the 1980s and later, as well as developments in steel technology that allowed for curved rooves in the 1990s onwards (e.g. Berman House). Upon celebrating 50 years of architectural practice in Australia, Seidler noted that developments in building technology allowed for more richness of form in his then soon-to-be completed Horizon apartment tower: "I could not have built Horizon twenty years ago...in earlier building technology (the way one could) span distancesit was very limited. (But Horizon) is made (possible) by devices such as prestressed concrete which is ...economic and quick. And that also gives you greater freedom of the shapes that you can use. Nowadays we can span huge distances and to do so (by) not just putting steel mesh or something into the concrete but to put steel, high tensile steel wire into it and pull it tight and that makes it easy to span distances and give this kind of change of shape of a building which would have been very difficult to achieve any other way." (Express, Australian Broadcasting Corporation, 7.10.1998). His visual approach to two-dimensional and three-dimensional spacial arrangement was consistent throughout his whole career. 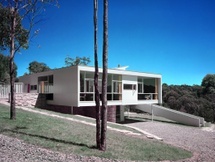 He articulated his approach in his first work, the Rose Seidler House. "This house explodes the surfaces that enclose a normal house or space, and turns it into a continuum of free standing planes, through which the eye can never see an end, you are always intrigued what’s beyond, you can always see something floating into the distance, there is never an obstruction to your vision, it is a continuum (of space), that I believe 20th century man’s eye and senses responds positively to that, we crave this”.Harry Seidler quote from “Rose Seidler House – the House that Harry built” (Review, Australian Broadcasting Corporation TV, 14 April 1991). In 1991, Seidler acknowledged that that his first house (Rose Seidler House) which was built of timber, despite the north facing sunshades "is generally too vulnerable to temperature changes...I didn't fully appreciate the intensity of the Australian sun"(Harry Seidler quote from “Rose Seidler House – the House that Harry built” Review, Australian Broadcasting Corporation TV, 14 April 1991). Thus, later in his career, he sought to use more thermally stable materials like reinforced concrete and to respond to Australian climate by the extensive use of sunshades and flamboyantly-shaped rain protecting canopies on his skyscrapers, (such as Grosvenor Place, Riverside Centre, and QV1), large covered balconies in his houses, as well as shaping his designs to maximize views and enjoyment of the outdoors from inside. Seidler was a frequent and enthusiastic collaborator with visual artists in the creation of his buildings. While his collaborators include famous or notable figures such as Alexander Calder, Frank Stella, Lin Utzon, Victor Vasarely, Norman Carlberg (a fellow but later student of Josef Albers), and many others, by far the most important of the collaborators was his mentor Albers. Seidler included works by Albers - perhaps the single person most influential on his design philosophy - in a number of projects (notably the MLC Centre with 'Homage to the Square' and 'The Wrestle'). As Paul Bartizan indicates in his obituary tribute to Seidler, these works of art were not mere 'plop art'; they were really planned to be integrated with and complementary to the buildings into which they were placed: "In many of his projects, Seidler worked with artists whose works became an intrinsic component of his designs."